The other day a friend on Facebook posted a link to a nice pizza dough post. However, that one took 18 hours! I sincerely hope that it was a typo and she meant something else. Even croissants take less time…although the pizza dough would just sit. Anyway, the recipe I found in one of my German cooking books was fairly simple and less time consuming. 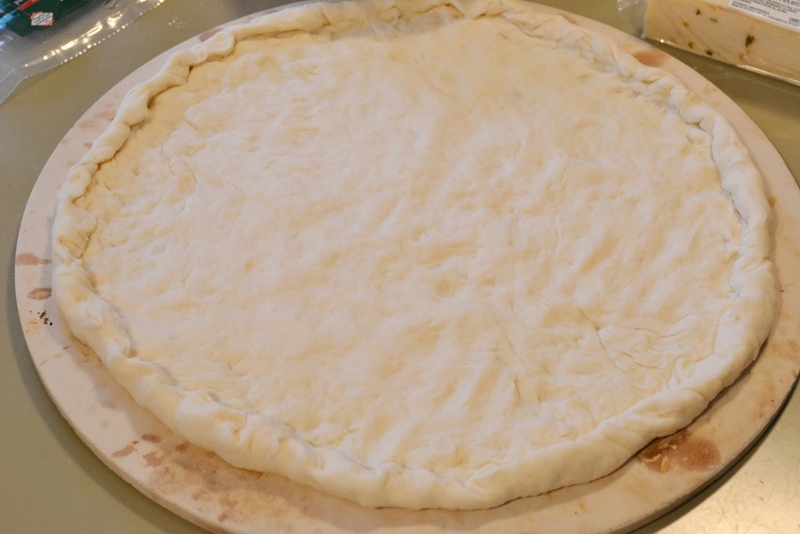 Dough on the pizza stone with rolled up crust. Mix the yeast in warm water and let sit for about 5 min or until bubbly. While waiting, mix flour, salt and butter and then add the yeast. Knead into a smooth dough. Should your dough be sticky, add more flour. If it is too crubly, add more water. Let the dough sit for about 30 min or until double in size. Remove the dough from the bowl and knead again, carefully. Then spread it onto your baking sheet or baking stone covered in parchment paper to prevent sticking. Stretch it and pat it until you’ve reached the desired thin/thickness and form. Make sure it’s evenly spread. 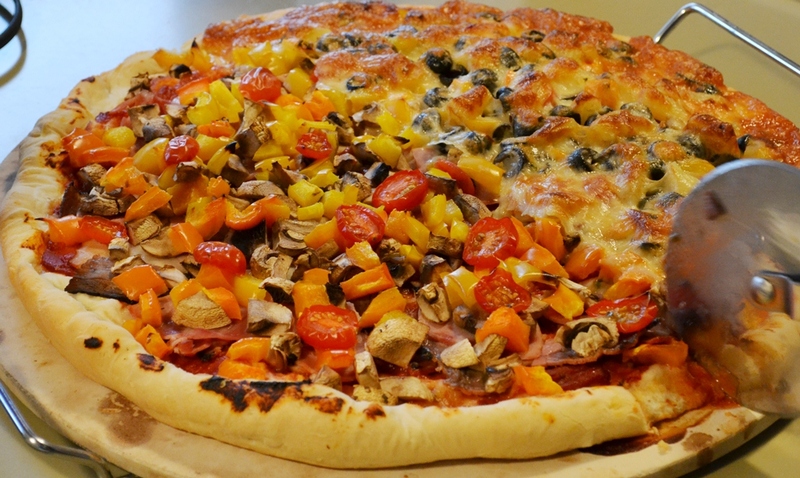 Tip 1: A pizza stone will bake your pizza quicker than a regular cookie sheet. 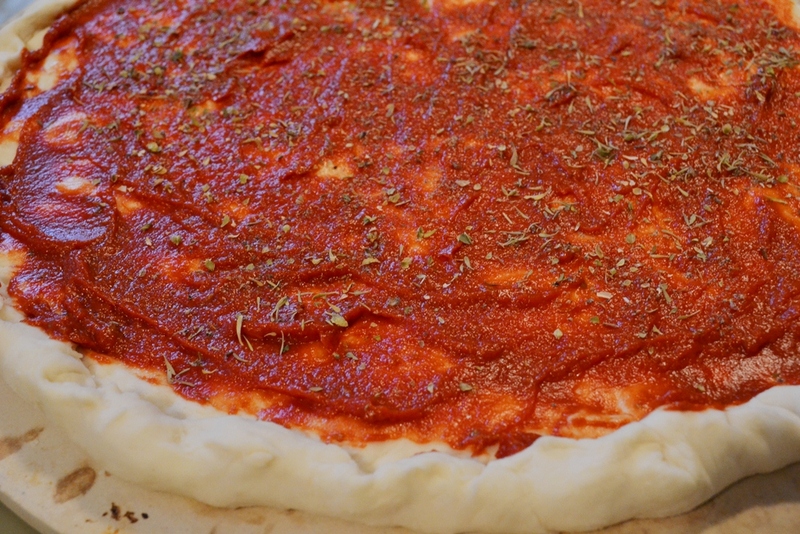 Tip 2: You can double the recipe easily for more dough if you want to make a sheet of pizza instead of a round pizza. Tip 3: You should roll up a bit of a crust so that liquids are not spilling. You can even roll in some cheese to have a nice cheese rust to nibble on. Now it’s time for the rest and this is entirely up to you. Here is how we do our pizza. Only one half gets the cheese. Mix about 2 tablespoons with some ketchup and oil and add as much dried basil and thyme as you like. 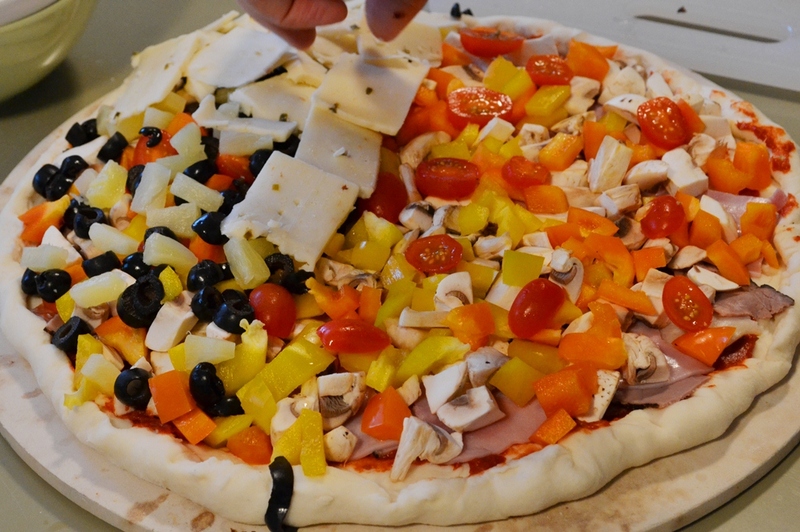 Spread it evenly on the pizza dough. 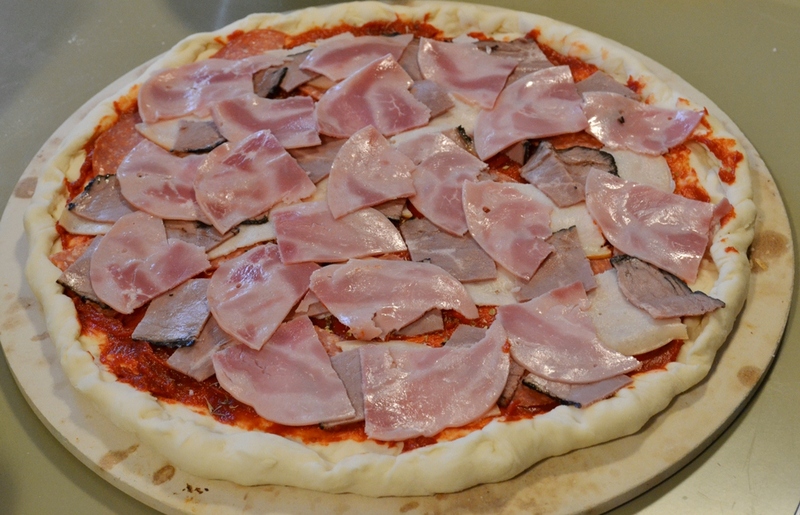 Cut up the cold cuts or use as whole and cover the pizza. 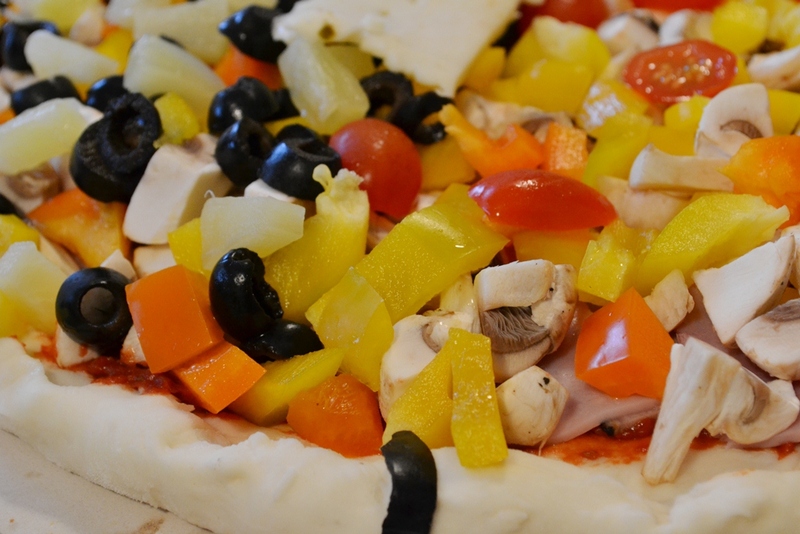 Chop up bell peppers and mushrooms and spread evenly. The olives and pineapple were already diced/slices. Make sure you drain them well because soggy pizza is no good. Finish off with your favourite cheese, either sliced or grated. I personally do not like cheese so that’s always left off my half. Tip 4: You can use other spices as well, depending on how you like the flavour of your pizza. Same goes for the topping. Personally, I like corn and kidney beans on my pizza, kind of Texas style. Bake at 200 – 220°C for about 30 to 40 min. Make sure you oven is hot! Depending on your oven and if you use a cookie sheet or pizza stone, it may take longer or shorter. Stay with it and check once in a while. If your cheese is golden-brown it’s done. Remove from the oven and be careful, this is hot. Let the pizza sit for about 10 to 15 min to cool it off slightly.